It’s like flying underwater! The Anfibia Board is the newest way to enjoy and explore the underwater world. You’ll feel like a dolphin or mermaid as you effortlessly glide through the water! Invented right here in Panama, the Anfibia Board is a semicircular, crescent shaped board with a slight curvature. When towed behind a boat at low speed, its hydrodynamic forms allow you to submerge and maneuver around, providing you with the incredible sensation of effortlessly “flying” underwater. You do NOT need to be an expert in the water to enjoy this activity. The Anfibia board can be enjoyed by people of all ages and abilities! It’s EASY! Just tilt the board down to submerge and tilt it back up to surface. 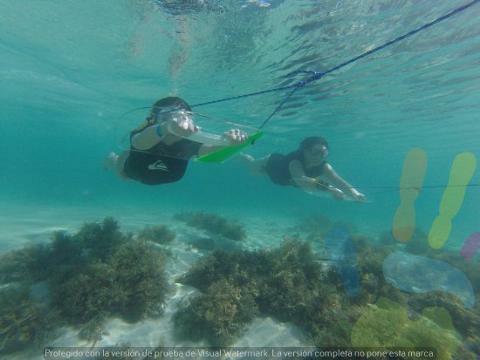 Bocas del Toro is one of the few places in the world that you can try this new aquatic activity!